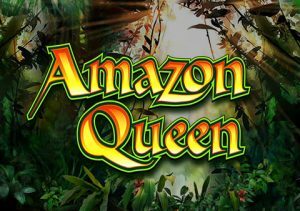 Venture deep into the rainforest where warrior women rule the jungle in Amazon Queen, a 5 reel, 20 payline video slot from WMS Gaming. This highly volatile game comes with win both ways payouts as well as a bonus feature that awards up to 100 free spins. Stakes range from between 20p and £60 per spin. Visually, Amazon Queen is typical WMS fare – instead of playing card numbers, the lower value symbols are made up of diamonds, clubs, spades and hearts. Higher up the payout food chain come jungle fruit as well as snakes, parrots and tigers (although we all know by now that tigers come from India and would never be found in the Amazon jungle!). Still, if we land 5 in a row we won’t be moaning about accuracy as they award 30 times your total stake. There are a couple of symbols to keep a special eye on – first is the mighty gorilla which offers payouts from both right to left as well as the more standard left to right. Land 3, 4 or 5 of these on a payline and you’ll pocket a payout of 2, 10 or 37.5 times your total bet. Better still is the fact that the gorilla can appear fully stacked, offering even or chances to create a bumper combination. The jungle clearing symbol is the wild – it too can appear fully stacked on the middle 3 reels and replaces all other symbols apart from the loin-cloth sporting Amazon Queen who triggers the Free Spins feature. Land 3, 4 or 5 of her and you can look forward to 10, 25 or 100 free spins. These free spins are played out on a new set of reels, complete with a soundtrack throbbing full of jungle rhythms. You can trigger more free spins here so hope to see the Amazon Queen put in another appearance. The jungle can be dangerous territory for the unwary traveller and that goes for your bankroll here – Amazon Queen is a volatile beast. You can endure lengthy spells when your money will disappear into the jungle ethers with little to show in return. Land the wilds in combination with the stacked, win both ways gorillas and the cashier can quickly rocket. Landing the full complement of 100 free spins is a rarity but it’s still possible to cash in with a decent haul if you hit 10 or 25. Plenty of patience is required if you plan on undertaking this jungle trek. An audience with the Amazon Queen can prove very rewarding if your luck is in though. If you like volatile games, WMS has plenty with Black Knight II my recommendation.